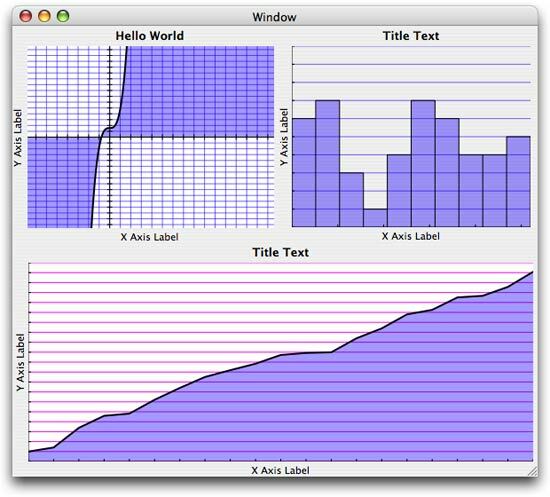 The recent FaceSpan 5.0d42 build includes a graphing plugin based on Chad Weider’s GraphX framework. Chad’s framework provides three graphing views: curve, histogram and scatter plot. As always when creating FaceSpan plugins from Cocoa frameworks, the tough part is converting the Cocoa APIs into a simple to use AppleScript syntax. In the case of these graphing views, I have substituted the ‘Data Source’ based APIs with a simple event for the curve view, and a value property that accepts a list of values to be graphed (a list of reals for the histogram and a list of x-y points for the scatter plot). The event is called repeatedly by the curve view to generate the data to be graphed. Here I simply generate a random series of values and assign them to the view’s value property. The plugin does the rest. Again, I simply generate a random series of point values and assign them to the view’s value property. The plugin does the rest. The sources for the plugin are included in the FaceSpan 5.0d42 SDK. This is awesome! There are great things happening here at LateNight Software! You know, I would very much like to look at the samples in this SDK. Is it available somewhere or only to internal testers? The FaceSpan SDK and sample plugins are not ready for public consumption at this time. Please contact me directly if you want to like to become an Alpha tester and you will be given access to the SDK and sample plug-ins.